16:10 MSK: We are wrapping up these live updates. Thank you for tuning in. 16:06 MSK: Moscow police confirm the leader of the Left Front Sergey Udaltsov and two other people have been detained. Law enforcers say that a group of 60 people headed by Udaltsov attempted to stage an unsanctioned march near Arbat Square. 15:30 MSK: A new protest is not yet being prepared, says a co-founder of the Voters' League, journalist Sergey Parkhomenko. “A new demo will take place when the need arises. No one can force the people’s interest,” he added. 15:14 MSK: Ryzhkov thanks the participants and asks that they leave the meeting “orderly and calmly.” The rally is officially over – an hour earlier than expected. 15:08 MSK: Ryzhkov urges a new protest on May 7 – the date when President-elect Vladimir Putin will be sworn in. “Will we come again?” he asks the demo. “Yes!” shout the protesters in reply. 15:08 MSK: In conclusion, Vladimir Ryzhkov reiterates the activists’ pledge to go on with their struggle to annul the results of the parliamentary and presidential elections. Election violators should be punished, including the head of the Central Election Commission, Vladimir Churov, he stressed. The country needs political reform allowing registration of all political parties, and political activists should be released from jail, he believes. 15:03 MSK: Radical activist Eduard Limonov doubts Udaltsov will be able to call a March of Millions in Moscow. He points out the “Fair Elections” demos are receiving less and less support with each event. 14:52 MSK: Some 50 nationalists have been detained in Moscow after police blocked their attempt to stage an unsanctioned march at the demo area, says the nationalists' leader Dmitry Demushkin. 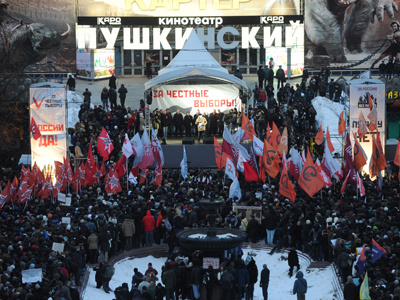 ­14:45 MSK: Banners over the stage read: “This is not president, this is not election”, “Russia will be free”, “New elections!" 14:35 MSK: Demonstrators are starting to leave the venue. 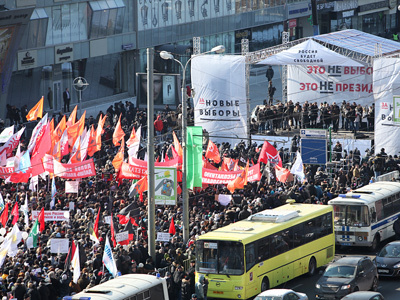 14:30 MSK: Leftist Udaltsov calls for a March of Millions before May. 14:25 MSK: Some 10,000 people have gathered for the event, say Moscow police, with most of demonstrators close to the stage and a couple of thousand dispersed around the area. Police had to prevent nationalists, who left the venue, from unsanctioned marching along the street with torches ablaze. 14:15 MSK: “Our fight will be hard and long, but Russia needs changes,” says Grigory Yavlinsky, the leader of the liberal party Yabloko. 14:00 MSK: Nationalists have left. Their leader, Dmitry Demushkin, says the liberals “have shot” the protest. 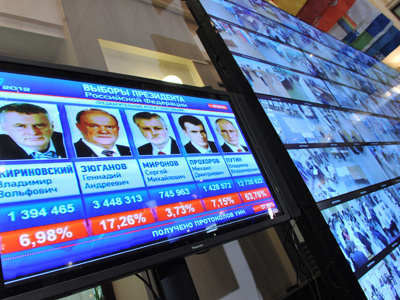 13:50 MSK: Grigory Melkoniyants, of the NGO Golos, says he does not know the true results of the presidential election, “but now all the data the electoral observers have gathered is being summarized. Independent lawyers will investigate all the violation claims.” He tells the demo of multiple rigging instances, mentioning stuffing ballot boxes and rewriting commission protocols. 13:43 MSK: Police estimate over 8,000 people have gathered for the rally. 13:35 MSK: “Putin is president of numbers, but not of people. We must fight for people, for every individual,” actor Maksim Vitorgan tells the crowd from the stage. 13:30 MSK: Opposition politician Vladimir Ryzhkov says today’s demonstration will focus on the presidential election, which took place on March 4. 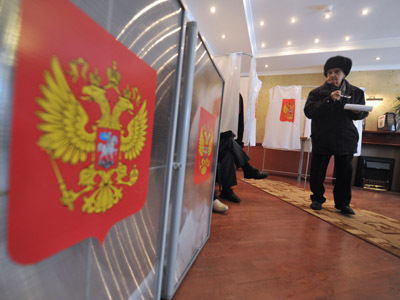 During the meeting Russian volunteers, who observed the election, are expected to report their findings on rigging. 13:14 MSK: The meeting has kicked off. 13:13 MSK: The Communist Party has joined the meeting. So have the activists of the Yabloko liberal party. In December, Yabloko failed to make it into the new State Duma, the lower chamber of the Russian parliament. Its leader, Grigory Yavlinsky, also had to abandon the presidential race early, after the Central Election Commission denied him registration. 13:10 MSK: All the participants are wearing white ribbons, scarves and other white tokens – the symbol of the movement “For Fair Elections.” Numerous anti-government banners are fluttering. 13:08 MSK: “Left Front” activists were the first to march into the meeting venue. People in the contingent are waving huge red banners. A column of nationalists followed; their flags are the white-yellow-black banners of the Russian Empire. 13:07 MSK: Sergey Udaltsov, the leader of the “Left Front” opposition group, has passed through a metal detector to the designated area. Police have boosted their presence in Moscow, keeping an eye on most of the central squares. 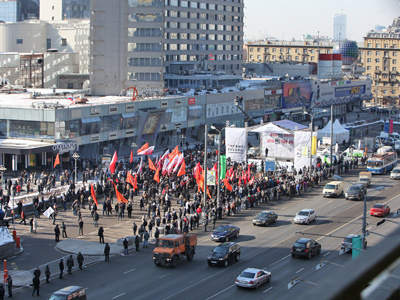 13:05 MSK: Several hundreds of people are already slowly making their way to the stage in New Arbat Street in Moscow’s center. 13:00 MSK: We are starting our live updates on the opposition rally protesting the results of the recent election, which brought a new term of presidential office for Prime Minister Vladimir Putin.